This semi-private, member-owned Country Club boasts two championship golf courses rated among the best in the Carolinas. The layouts, known as The Pines and The River Courses, were designed by the world-famous Ellis Maples, who called Whispering Pines his home. Both courses have Bermuda 419 fairways and Pencross bent grass greens. The Pines Course was the host site in the year 2000 for the Women’s Eastern Golf Association championship. Playing across large greens and rolling fairways lined with pine trees and strategically placed bunkers, The Pines Course is both a challenge for the low handicapper and a pleasure to play for others. There are five tee locations so that every level of player can hope for that elusive par. 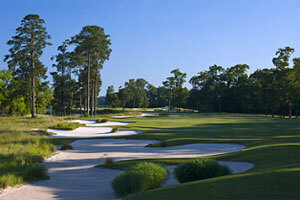 The Pines Course is par 72 and The River Course is par 71. The Pines plays about 524 yards longer at 7094 yards versus the River’s 6570 yards. Shorter than its sister course, The River Course is made for the more precise golfer and is a striking contrast to The Pines. Smaller greens, with ponds and streams in play on 12 holes, and complemented by a picturesque setting, The River Course is a welcome diversion for members and guests alike. The impressive clubhouse features a well-stocked Golf Shop and full locker room facilities for men and women. A restaurant, bar, and large banquet area means that the clubhouse is always playing host to some type of social function. A driving range, a practice pitching green complete with sand bunkers, and two putting greens are available to fine tune your game.